"With two outs they got a base hit right between first and second. The second baseman missed it by 'that' far," said Brockshus, holding two fingers just a few inches apart. "That's the honest truth," he said. "I can still see it." Brockshus, 73, was a hard-throwing farm boy for Williamsburg in those days and one of the top pitchers in the state. "I would throw a lot of bales during the day and I would go in at night and pitch baseball," he said. "And I had pretty good success." He fanned eight straight batters at one point in that 1962 championship game and finished with a four-hitter. Brockshus is still having success at baseball fields in Iowa. 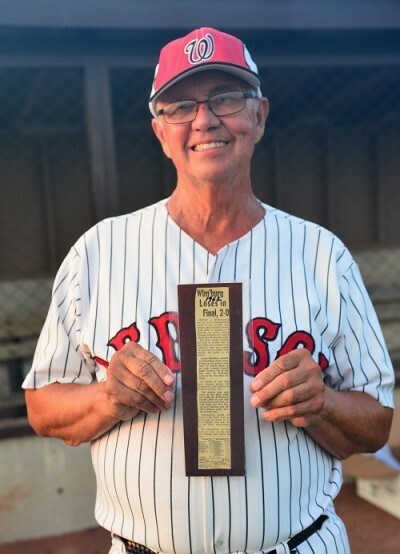 He's been associated with the Williamsburg Red Sox semi-pro team for 55 years and struck paydirt again this Sunday when the Red Sox captured the IABA state title for the first time since 1988. He's been a player, coach, general manager and public address announcer for the Red Sox. 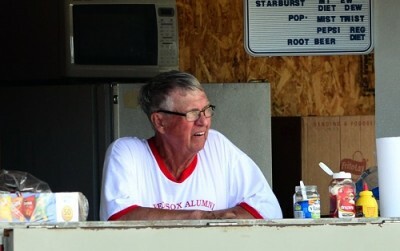 He's also been a key member in the concession stand and has spent countless hours keeping the Williamsburg diamond in shape. He taught school for 11 years and worked for the Hawkeye Security Insurance Company in Des Moines for 23 years, but during all that time he always returned to Williamsburg and Eastern Iowa on Sundays to help the Red Sox. "I wanted to keep the Red Sox going," he said modestly. The state tournament in 1962 was a one-class event, not like the four classes they have today. That meant a small school like Williamsburg had to beat bigger schools along the way to the state tournament. And they did. Brockshus remembers the state finals like it was yesterday. "It was great," he said. "There were hardly any people left in Williamsburg. I'm serious. Charter buses went up there. Six or seven school buses. There weren't many people left in Williamsburg that night." Brockshus pitched for Upper Iowa University after graduating from Williamsburg High School. He finished seventh in the nation in earned run average as a freshman and had a look-see from several pro scouts, just like he did at the state finals. One year, he pitched against the minor league team from Cedar Rapids in a simulated game and thought it might lead to a pro contract, but nothing ever happened. "I don't know why," he said. "I went up to Cedar Rapids and pitched against them and they couldn't hit me. They couldn't hit me at all." Brockshus got his degree from Upper Iowa and became a teacher instead. "One guy told me I would make more money teaching," he said. "I don't know why I never made it." Brockshus moved back to Williamsburg after being a teacher and insurance agent for about 34 years in Central Iowa to help on the farm. And he's still putting on that uniform for the Red Sox in the Iowa Valley League after all these years. "Love of the game," he said. "And a lot of stories."